Electrospinning is a voltage-driven process governed by the electrohydrodynamic phenomena where fibers and particles are made from a polymer solution. The most basic set up for this technique involves a solution contained in a reservoir (typically a syringe) and tipped with a blunt needle (for needle-based electrospraying), a pump, a high voltage power source and a collector. The spinning process starts when the solution is pumped at a constant flow rate and a specific voltage is applied to create an electric field between the needle tip and the collector. A charge accumulates at the liquid surface. When the electrostatic repulsion is higher than the surface tension the liquid meniscus is deformed into a conically shaped structure known as the Taylor cone. Diagram of a Taylor Cone, with no voltage / applied voltage. Once the Taylor cone is formed, the charged liquid jet is ejected towards the collector. Collectors can be but are not limited to, stationary flat plates, rotating drums, mandrels, and disks. Depending on the solution viscosity solid fibers will be formed as the solvent evaporates from the whipping motion that occurs during its flight time from the Taylor cone to the collector. The result is a non-woven fiber mat that is deposited on the collector. Electrospinning is a manufacturing technique involving electrostatic driven process used to create electrospun fibers. The diameter of these fibers typically ranges between tens of nanometers to a few micrometers. One of the main advantages of the electrospinning technique is its versatility of processing to create fibers with multiple arrangements and morphological structures. The popularity of the electrospinning technique has allowed multiple technologies such as tissue engineering, regenerative medicine, and encapsulation of bioactive molecules, to emerge and evolve over the past decade. These days the electrospinning technique is not just for academic research, but one with real commercial applications. Currently, multiple industries around the world have adopted this technique in the development of new product innovations. Some of the applications where electrospinning is being currently used are tissue engineering (NanoAlignedTM, NanoECMTM, NanoCareTM, NanoMeshTM, Absorv®, TegadermTM), drug delivery (Rivelin® Patch), food encapsulation, insulating materials, energy conversion and storage, air and water filtration, among others. There are two ways nanofibers can be made through the electrospinning technique: needle-less and needle-based. Prior to selecting which method it is important to consider the advantages and disadvantages of both. In needle-less electrospinning, the starting polymer solution is transferred to an open vessel where the fibers are generated from a stationary or rotating platform. Mass production of material is one benefit in the needle-less electrospinning process but there are many disadvantages. Fiber morphology and quality are not precisely controlled, the raw materials that can be utilized are limited, which in turn limits versatile fiber production and process parameters such as flow rate, cannot be controlled. 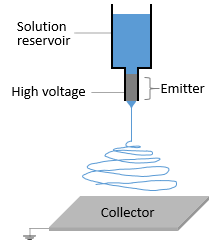 In needle-based electrospinning, the starting polymer solution is typically contained in an air-tight closed reservoir, this minimizes and prevents solvent evaporation. This important difference allows for a wide variety of materials, including high volatile solvents, to be easily processed. There are many advantages of needle-based electrospinning, including flexibility to process different structures like core-shell and multi-axial fibers. This distinction allows for active pharmaceutical ingredients (API) to be incorporated within a fiber. Additional advantages of needle-based electrospinning is tightly controlled flow rate, number of jets and minimizing solution waste. These advantages of needle-based electrospinning have increased the popularity of this technique, resulting in a high number of published work on electrospun fibers that offer a wide variability of solution recipes.